The Wilson Burn 100 Team is a high-quality, lightweight tennis racket best suited to baseline players who want to improve their on-court skills and make the most of their performance. It has a head light balance and an enlarged sweet spot which offers more power and makes the racket more forgiving on off-centre shots. 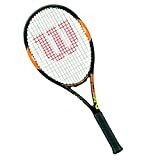 The racquet is easy to manoeuvre and features a spin encouraging 16×20 string pattern. The Full BLX graphite frame is stiff and durable and the racket is supplied strung with a Sensation string and a Cushion Air Perforated grip. This entry was posted in Tennis and tagged Black/Orange/Gunmetal/Orange, Burn, grip, Racquet, Team, Tennis, Wilson by FPSports. Bookmark the permalink.